Sean Lynch races after the ball. The sophomore midfielder and the Wildcats will battle Western Illinois on Monday. Soccer, coach Tim Lenahan said, is a lot like calculus. 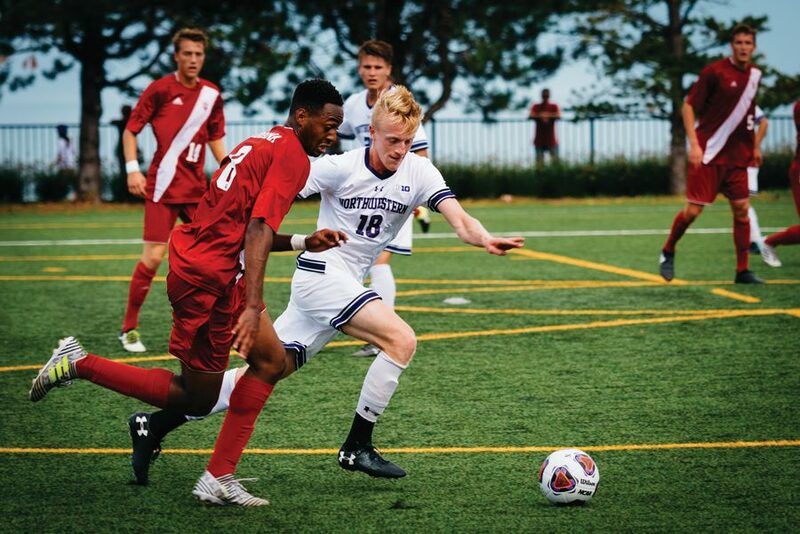 The coach –– in his 17th year at the helm of the Northwestern program –– jokes with his team that in calculus, “you have to know the next chapter’s based on the previous chapter,” and that the same applies to soccer, where lessons learned from one game must be applied to the next. Heading into the final six games of the regular season, and coming off a grueling road trip that saw the Wildcats face three ranked opponents in 10 days, that analogy is more applicable than ever for NU. NU (2-9-0, 0-5-0 Big Ten) will need to use the lessons from the last three games to boost its attack, Lenahan said. The Cats will play their first of four final home games Monday against nonconference opponent Western Illinois (4-5-0, 2-0-0 Summit League). NU is coming off a 2-1 overtime loss to Notre Dame last Tuesday. The Cats held the lead against the Fighting Irish for 79 minutes before conceding the game-tying goal and ultimately falling in the extra period. A bright spot in Tuesday’s loss came from freshman midfielder Tommy Katsiyiannis, who scored his first career goal in the 36th minute. Katsiyiannis’s early score represented a rare occurrence this season: a strong start. Of the seven goals NU has scored this season, only two have come in the first half. Thirteen of the 22 goals the Cats have allowed their opponents to score this season have come in that first period. The loss to the Fighting Irish wrapped up a two-week road stretch that saw NU face three formidable opponents: Michigan, No. 3 Maryland and No. 9 Notre Dame. Against the Fighting Leathernecks, the Cats will look for strong performances from Lynch and Ozumba, the team leaders in goals and shots on goal, respectively. Lynch has two goals and two assists on the year, while Ozumba has six shots on goal in 11 games. Western Illinois enters Monday’s matchup on a two-game win streak and averages nearly two goals and more than 11 shots per game.